Mr. Amrin Amin, Parliamentary Secretary, Ministry of Home Affairs and Ministry of Health launched the National University of Singapore Centre for Additive Manufacturing (AM.NUS) at the Additive Manufacturing Summit for Healthcare jointly organised by the National Additive Manufacturing (AM; commonly known as 3D printing) Innovation Cluster (NAMIC) and NUS Enterprise, on July 21, 2017. Since its formation in 2015, NAMIC has built a cluster organisation around the AM R&D hubs in NUS (National University of Singapore, SUTD (Singapore University of Technology and Design) and NTU (Nanyang Technological University) 3D printing centres. It has established itself as the nexus of AM and Industry 4.0 public-private initiatives locally through its network of trade associations, economic agencies, and companies. The establishment of AM.NUS is jointly supported by NAMIC and the Singapore Economic Development Board (EDB). AM.NUS has received an initial funding of of S$18 million from NUS, NAMIC and EDB and will focus on the development and application of ground-breaking AM technology in the biomedical and healthcare fields (OpenGov produced a short summary of the applications of 3D-printing in the healthcare sector recently). 1. Surgical Instruments, Simulation & Prosthetics: Led by the Division of Industrial Design, designers and researchers are creating realistic, customisable, and reusable simulators and instruments to train and educate the next generation of doctors and simplify difficult clinical tasks. The team also has experience in designing functional prosthetics using 3D printing methods. 2. Restorative Repair and Implants: Engineers at the Faculty of Engineering are devising new 3D printing technologies and materials. They are utilising the latest in ceramic and metal 3D printing materials and techniques to bring a new generation of implants to the market. 3. AM Enabled Medicine: Researchers at the School of Pharmacy are leading efforts for the novel formulation of drugs and precise control of dosage and release patterns for every individual. In the future, pharmacists will not need to dispense multiple drugs, but 3D print a custom tablet on the spot. 4. 3D Bioprinting for Tissue Repair: 22 people die every day while waiting unsuccessfully for a donor organ. 3D printing offers a potential solution for the shortage of organs available for donation. Scientists and engineers at the School of Medicine will use advanced materials and scaffold printing techniques, combined with cell and tissue engineering, to develop new solutions for regenerating and replacing damaged tissues. 5. Oral Health and Craniofacial Applications: 3D printing fits right in with the highly detailed customisation requirements of dentistry.The Faculty of Dentistry will be leading in this area. AM.NUS consists of two laboratories, one located at the Yong Loo Lin School of Medicine and the other at the Faculty of Engineering. They are equipped with the latest AM equipment, including powder, plastics and liquid based printers, 3D scanners, CAD (computer aided design) image processing and design software, as well as testing and validation facilities. AM.NUS will also help in deepening the local talent pool in the area of AM by offering AM-related courses for post-graduate students. It will enable graduates to learn and gain hands-on experience in AM processes, materials technologies and design for AM principles. AM.NUS is working closely with industry partners to develop and transfer AM technologies for biomedical applications. AM.NUS has signed signed Memorandums of Understanding (MOUs) with four industry partners for collaboration. Local SME, Creatz3D will partner with AM.NUS to develop next generation medical training and educational simulation applications, while Dou Yee Enterprises, which has an established base of manufacturing in powder injection moulding will collaborate with AM.NUS to develop 3D printed precision parts using ceramic and metal materials. Forefront Additive Manufacturing, a local precision engineering company will leverage on AM.NUS biomedical capabilities to develop their business in the healthcare space. Osteopore International, which is involved in designing, developing and marketing bioresorbable polymer implants for neurosurgical, orthopedic, and maxillofacial surgery use, will partner AM.NUS in the design, development and clinical trials of 3D printed bioscaffolds (tissue-like three-dimensional structures can be generated by dispensing cells onto the biocompatible scaffold), for orthopaedic applications. "AM.NUS will bring together NUS technologies with industry expertise, enabling the accelerated translation of NUS technologies into innovative healthcare products and services. The Centre is already working on a total of 17 collaborative projects, and has raised about S$4.7 million in additional project funding." said Dr Lily Chan, CEO NUS Enterprise. 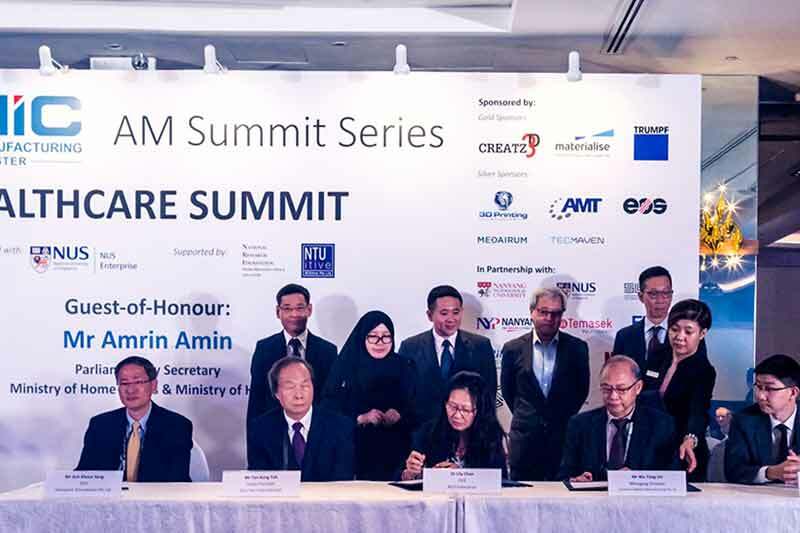 “As a cluster founding member, together with NTU’s Singapore Centre for 3D Printing and SUTD’s Digital Manufacturing and Design Research Centre, the NUS Centre for Additive Manufacturing will play a vital role in NAMIC’s translational research and industry adoption efforts, further strengthening Singapore’s efforts to become a global 3D printing technology hub. As the industrialisation of 3D printing gains momentum, our goal is help the sector achieve better patient outcomes, addressing the needs of our bio-medical and patient community with cost-effective and personalised healthcare solutions.” said Dr Ho Chaw Sing, Managing Director NAMIC. AM.NUS worked with the NUH department of orthopedics to assist in the planning of complicated surgeries and revision procedures where implants have failed. In 2016, researchers from NUS developed a new method of tablet fabrication, that can make customisable pills that release drugs with any desired release profiles.